The annual band banquet will be held on Saturday, May 11th from 7:00 until 10:00 pm in the MHS lunch room. All band and auxiliary members in grades 7-12 and families are invited to attend. Seniors and their parents are free. Individuals are $10.00 each, and a discounted price of $25.00 is offered to families. Dates (including dates of senior band members) are $10.00 each and are not included in the family discount. 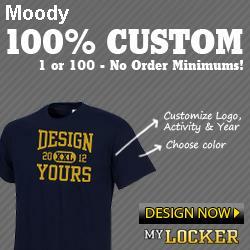 Make all checks payable to the Moody Band Boosters. The banquet will consist of a dessert reception, awards and recognitions, and a dance. Volunteers are needed to help with all aspects of the event, including set-up on Friday and take-down on Saturday evening. Please contact Alice Freeman at 640-6945 to volunteer. Reservation forms will be distributed from the band room and posted in the files section of the Moody Blue Devils Yahoo Group. Register at www.moodyband.org for access to the file and to group postings. Reservations are due to Dr. Sargent by Thursday, May 2nd in the band room. Please make your plans to attend!